Traveling the South of Argentina can be a bit physically grueling and not easy on the walley. Nevertheless, there are some things that one must see if you travel to the Patagonian region. San Carlos de Bariloche is a touristy, Swiss-style town with many outdoor activities to work off all the chocolate you consume. Some of my favorite activities were hiking up the Cerro Camponario (take local buses 22, 21 or 10) and riding hybrid-mountain bikes through 25 kms of “good” Argentine roads (potholes are a pervasive part of the pavement’s compostion). There are two companies from which you can rent bicycles (take the same local buses as above) and the hostels are usually able to reserve you one. The buses, or colectivos, cost $6AR pesos and they do give change within reason (unlike Buenos Aires)! El Bolson is a small, hippie village nestled in the Andean range that is incredibly accessible from Bariloche. Many companies offer seats and the cost is between $20AR and $23AR (between $6US and $7US). While in Bariloche, everyone recommended the town for its trails and artisanal beer. As a result of being the town that grows a ton of hops, there are so many independent beer labels that it would have been impossible to try them all in the few nights that I was there, although I did give it a decent attempt. I highly recommend hitting up Lago Puelo because of its pebble beaches, crisp water and, overall feeling of absolute tranquility. You have to take the local bus to this out-of-town gem and keep in mind that these buses only run every hour, so don’t miss it! This brings me to El Calafate, undoubtedly the most expensive town to visit, at least from my experience. The hostels are a little pricier and excursions to the Perito Moreno glacier were a little out of my budget. So, my travel-bud and I made our own excursion: we rented a car. For, essentially, the same price as the bus, we were able to take different roads to the glacier, stop if we wanted to take photographs of random flamingos nibbling, and even check out some other spots around the town. The price was $250AR pesos (about $80US) for 200 kms and 24 hours. Split between four people (we found joiners on the bus ride to El Calafate), it was almost a steal. However, be forewarned, there is a “cover charge” of $75AR pesos (about $20US) to enter the park where the glacier rests. You have to pay it whether you rent a car, take a bus, or pay $700AR pesos to do a day of trekking on the glacier. What was great was that there are ferry rides that bring you pretty close to the massive piece of splendour, something we tried to do but ended up missing the last ferry ride. At the end of your stay in El Calafate, buy chocolate. There is a shop called Guerrero on San Martin, the main street, that is small, independent, and has delicious choices of chocolate. I recommend the bitter-chocolate-covered-peanuts. Muy ricos. In the end, no matter what you end up doing, when you are standing in front of the world’s fastest growing glacier (2 meters per year), it will be worth it. 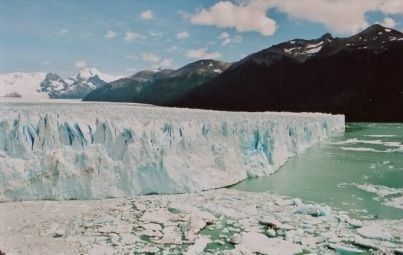 As another glacial tip, many recommend that you see Perito Moreno in January or February as these are the months that the most ice falls. It’s pretty surreal watching a natural wonder shed old layers and the thunderous boom that follows.